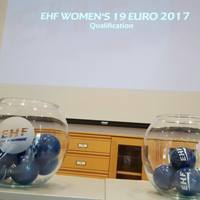 The EHF Office in Vienna hosted the draw for the Women's 19 EHF EURO 2017 Qualification on Tuesday..
Slovenia as organisers as well as Denmark and Russia as the teams ranked first and second at the Women's 17 EHF EURO 2015 are already qualified for the final tournament. Subsequently there are 13 spots left for which 30 teams vie when the qualification is played from 17 to 19 March 2017. These 30 teams were drawn to six groups of four teams each and to two groups of three teams each. The top two teams of Groups 1 to 5 and the first ranked teams only from Groups 6 to 8 qualify for Slovenia 2017. The first right to organise went to the teams in Row 2, then 3, 4, 1. As Poland already organised a tournament in the Women's 17 EHF EURO 2015 Qualification, the right to organise went to Latvia. The Women's 19 EHF EURO 2017 takes place in Slovenia from 27 July to 6 August.